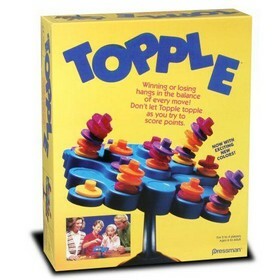 Topple is a game that maintains the same idea as the Jenga stacking game when it comes to balance. The distinction between the two is that it includes a scoring system and is a lot easier to set up when it gets knocked over. The basic gameplay is simple enough: take turns stacking little hats on the balance board in rows to accumulate points. All you need to do to set it up is connect the main board to its stem and find a flat surface to play on (and uh, not partake during an earthquake). Divide the game pieces by color to each player, and have the highest roller build first. On his turn, a player will always roll the die to determine which quadrant he will place one of his colored hats on. A one represents the center and topmost space, while a toss of five will find his piece balancing precariously outward and on the edge of the board. If the competitor rolls a six, he may place his piece on any spot on the board (a fortunate roll indeed if he thinks the Topple board might lose it on his turn).The scoring mechanism is kind of a pain. A player scores three points each time he completes a line of five Topple pegs in any direction. A bonus point is awarded for each stack in that same row that has one of his personal pegs at the top. Subsequent additions to such rows of five are awarded the bonus points only. The third way to score is to build pieces vertically. Anytime a piece is added to a three-high stack, you get to add a point to the score sheet for each color it contains that is yours (calling out a witty “Connect four!” is optional). It’s possible to score in many directions and on several planes with one turn. If the board or even just part of the board falls apart during your turn, you lose 10 points and the round is over. The player who went directly before you amasses three points. Topple is – like I said – easier to set up then Jenga, but that’s about all it has going for it. The rules provide for a two player variation and younger person games, but it’s no matter because Topple really isn’t all that interesting. The scoring situation is kind of crazy; and sometimes you might not Topple the board at all despite putting down all of the pieces. Topple is a game you can play once or twice and be done with. Play it more than that and you’re sure to be bored and want your time back. Some people out there will find it fun for awhile, but all in all, it really doesn’t have lasting appeal for anyone.